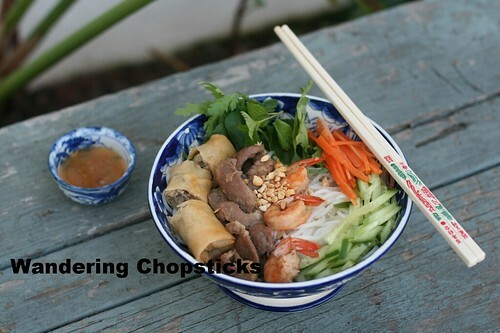 After experimenting with a bunch of food lately, I've been craving Vietnamese comfort foods. Which is great because it gave me a chance to update photos of some of my more popular recipes. One of my favorites is Bun Thit Heo Nuong, Tom, Cha Gio (Vietnamese Rice Vermicelli Noodles with Grilled Pork, Shrimp, and Egg Rolls). Bun (rice vermicelli noodles) and com tam (broken rice) dishes may appear varied on restaurant menus but the key is to realize that the multiple listings are just various combos of those items. Add or subtract ingredients as you wish. Optional: Add 1 tsp Indonesian kecap manis for color. Tom Xao Bo (Vietnamese Shrimp Sauteed in Butter). Cha Gio (Vietnamese Egg Rolls). Do Chua (Vietnamese Pickled Stuff ie. Carrots and Daikon). Slice the pork into 2-inch-by-1/2-inch strips. It doesn't need to be paper-thin, just thin enough to cook quickly. 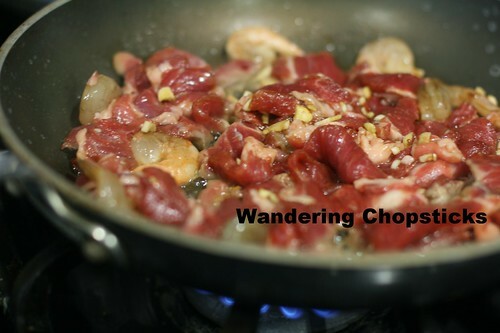 Add 4 cloves minced garlic, 1 large minced shallot, 2 tsps fish sauce, 1 tsp sugar, 1 tsp salt, and 1 tsp ground black pepper. Mix thoroughly and set aside. If you plan to grill this, leave to marinate for about half an hour before cooking. 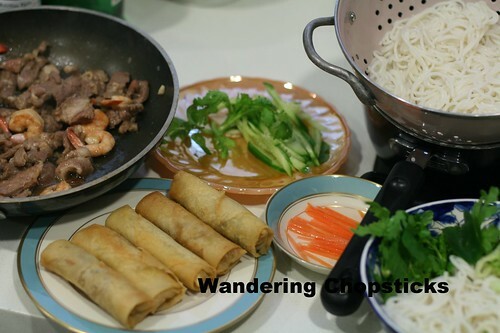 While the meat is marinating, make the egg rolls, boil the noodles, and prepare the garnishes. When everything is ready, cook the meat. You can grill, but sometimes I just cook everything in a saute pan. Toss in some shrimp too if you'd like. 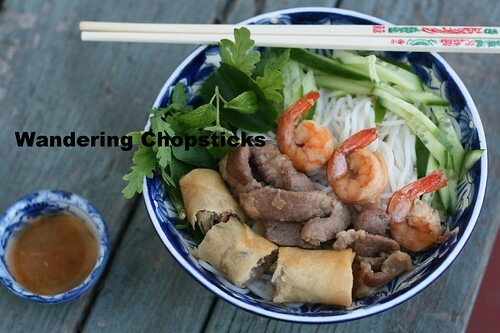 Add noodles to the bottom of the bowl, layer with herbs, cucumbers, pork, shrimp, and egg rolls. The saucer of fish dipping sauce is to be poured over the bowl if you wish. Hmm. What's missing? Oops! Forgot the pickled carrots and crushed peanuts. Now, it's complete. Dig in! For one of my most popular recipes, and something I eat fairly often, I've just been lazy about updating the photos. Egads! Seven years ago this sad picture garnered quite a bit of praise. 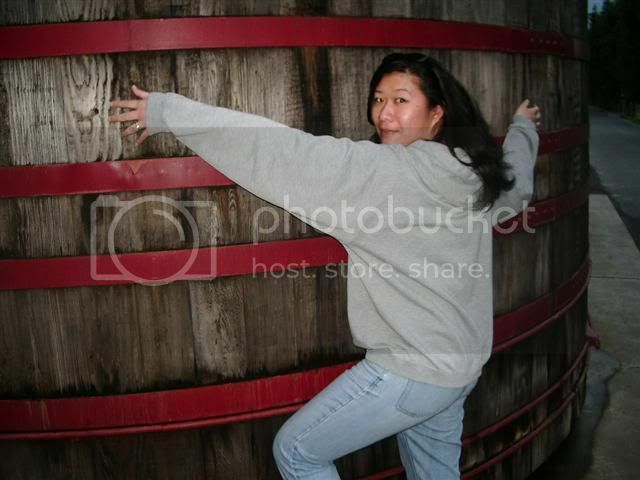 You'll have to agree with me that the new pictures are way better! 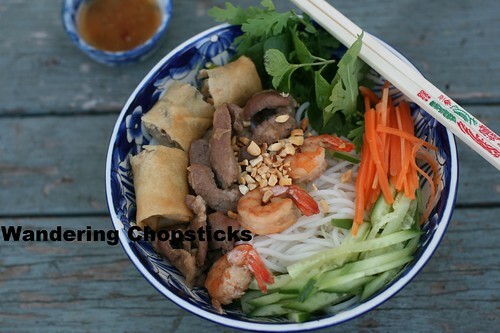 Who made my recipe for bun tom nuong? Pepy of The Art and Science of Food said, "...I'm very satisfied with the result as it tasted damn close with the restaurant ones!" 1 year ago today, Thit Kho Trung (Vietnamese Braised Pork with Hard-Boiled Eggs). What a gorgeous plate of food...people pay to eat this stuff you know? 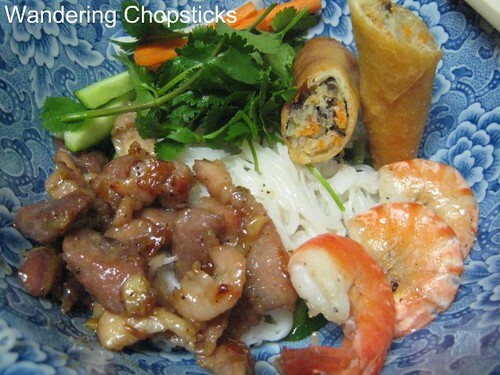 I'm absolutely crazy about the grilled pork with fried roll and noodles. I get it just about everytime I go to a pho restaurant. Thanks for the recipe! I'll make this for when the weather's warmer. oh nice! The grilled pork certainly sounds good! 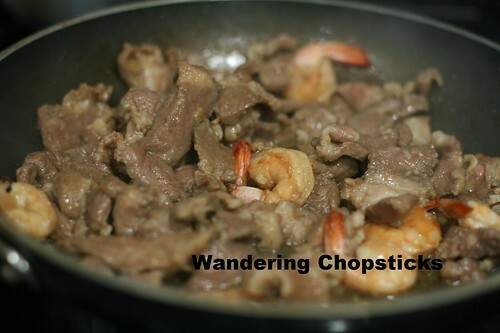 I have made your thit kho recipe several times since last year and your new photo looks great! What camera did you get? And as for bun tom etc., that's one of my favorites to order at VN restaurant that I don't know well -- seems like most do it well :-) I like your grilled pork recipe - will try it broiled. a friend of mine bought me few packs when he was back from Ha Noi. He told me those are made by rice. Even thinner than a pc of paper. Shrimp three days in a row, you rock! Your new goi cuon picturs are absolutely lovely. The beautiful blue rimmed plate makes them pop! Aww, your compliment was too nice. Too bad there's no such thing as scratch and sniff over the internet. Hmm. I never got an email with the previous comment so I think the Blogger bugs must have eaten it. I didn't know you made my thit kho recipe before! Oh, wait, I think I remember suggesting you make kho, but I didn't realize it was my recipe that you made. I just upgraded my elph, so instead of a Canon SD110, it's a 1000. Hehe, is it me or is that portion mighty small? I feel like I could eat way more than that! Nice presentation though! Thanks for the recipe! I always get this at Vietnamese places, but now I can make it at home! 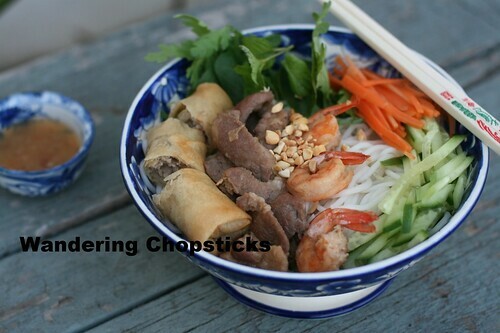 My mom tried making this once, but the vermicelli clumped together. 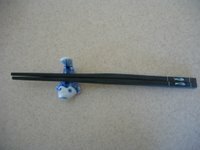 Which brand/type of vermicelli should that doesn't stick? Am looking forward to trying your Vietnamese recipes when I have access to a proper kitchen. Dorms don't offer much. I don't have any preferred brand, I just buy what's cheap. My trick for getting the noodles to not stick together is to upend a rice bowl into the bottom of the colander to reduce surface area. 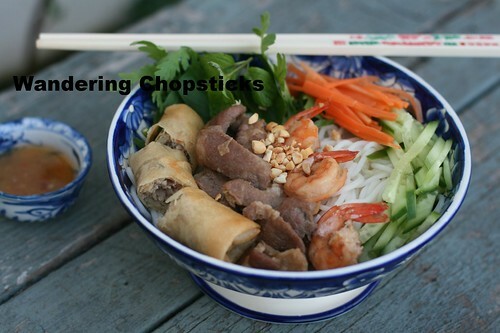 Look at either my pho bo or pho ga recipes for pictures of what I'm talking about. Yoooohooo!! I made the grilled pork last night. It was very good! I love your blog, good job!! 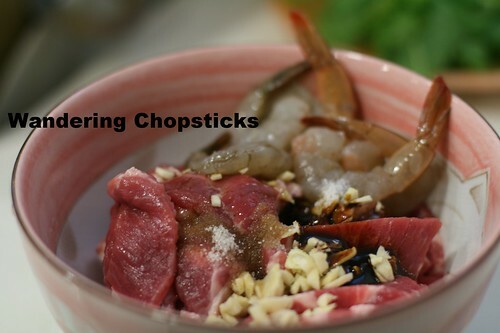 I just had a nice bowl of Bun with Sugarcane shrimps, grilled beef, fried spring rolls, grilled beef balls and grilled prawns for lunch. I was torn between the Bun and Pho, my all time favourite. I think i should try making this at home. Thanks for the reminder. I still haven't done a grilled beef recipe yet. It's a super easy recipe to make at home. Thanks for pointing it out. This is an old recipe and I'd reduce the salt and fish sauce quite a bit compared to how I write my recipe now. Will fix that. Hi, thanks for sharing all teh wonderful recipes. I am planning to make this soon and wondering if you had already made the adjustments to the salt level mentioned above or should I do that on my own? Thanks! I adjusted the salt and fish sauce a while back so you can go with what's listed here. But as always, feel free to adjust to suit your tastebuds.